In the heart of Budapest, you will find Liberty Square. At the southern end of the square there is a crude stone and bronze monument – it commemorates the victims of the 1944 Nazi occupation of Hungary. But even the most cursory look at the monument should set alarm bells ringing. The monument depicts Germany as a bronze eagle swooping down on a statue of the archangel Gabriel, the symbol of Hungary. But Hungary was not just a victim of Nazi terror – it was one of Hitler’s allies. Admiral Miklós Horthy’s regime (1920-1944) passed dozens of laws restricting the rights of Hungary’s Jewish population, laying the ground for their eventual deportation to the Nazis’ death camps. And when the Hungarian nazi party, the Arrow Cross, was installed by Hitler to rule the country in October 1944 it massacred 38,000 Jews and 28,000 Roma and socialists. It also helped the Nazis deport 500,000 Hungarian Jews to the death camp at Auschwitz. Today’s prime minister Viktor Orbán and his authoritarian far right Fidesz government commissioned the monument in 2014 to commemorate the 70th anniversary of the 1944 German occupation of Hungary. It was erected under cover of darkness and with great secrecy. More than 100 police officers closed off the square and threatened to arrest anyone who attempted to enter it. Under pressure from the press the chancellor, Fidesz’s János Lázár, promised the monument would be officially opened the next day. But there was no official opening. Lázár latter said the government did not want to “triumphantly” unveil the monument. Hungarian Jewish community leaders protested when it was discovered that the Hebrew inscription on the monument had mistranslated the word “victims” as “sacrificial animals”. This was corrected after a huge public outcry. Across the road from this “official” memorial, a spontaneous public memorial to Hungarian Jewish and Roma victims of the Holocaust has risen. Barbed wire has been strung between wooden posts, and hanging from it are dozens of heart-wrenching letters, prayer books and worn photographs of Hungary’s Holocaust victims. On the ground below the barbed wire are hundreds of small stones, in the Jewish tradition of leaving a stone as an act of remembrance for the dead. Once a week at 5.30pm a small group of Jewish activists and anti-racists gathers at the unofficial memorial, pay their respects to the victims of the Holocaust and protest against the grotesque “official” memorial. Afterwards, they go to a nearby café and one of the activists gives a short talk about the Holocaust. On 23 February thousands of students took to the streets in Budapest protesting against the Fidesz government’s education policies. Before the demonstration a small group of students joined the unofficial memorial vigil. 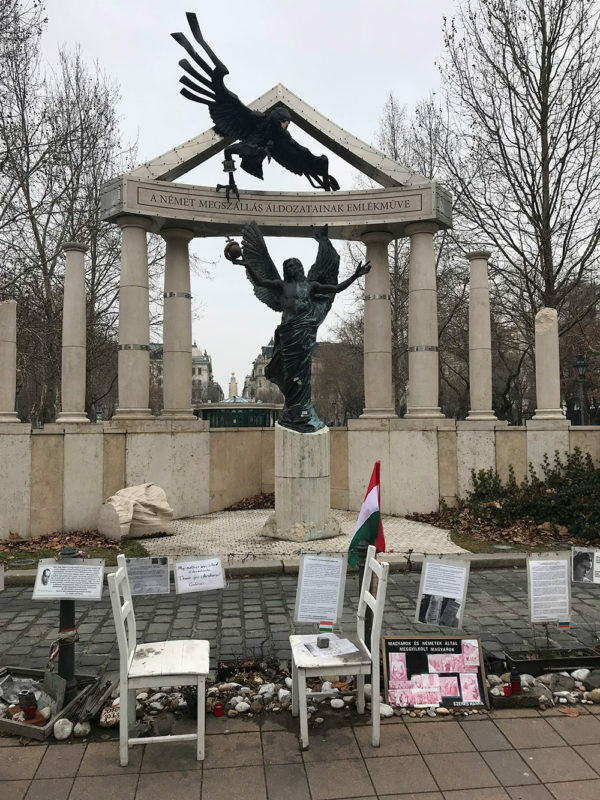 The “official” monument is an insult to the 550,000 Hungarian Jewish and 25,000 Hungarian Roma victims of the Nazi Holocaust and Porajmos (the Roma term for the Holocaust). 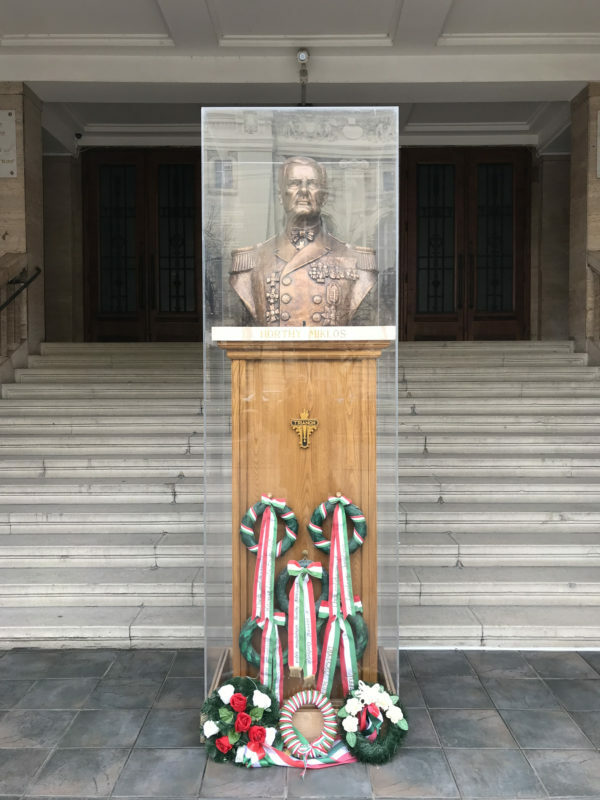 Just 30 metres from the “official” memorial and placed at the bottom of the steps of the Homecoming Presbyterian Church (Hazatérés Református Templom) a statue of Admiral Miklós Horthy was erected in 2013. It has become a site of pilgrimage for the far right. There have been reports of nazis mocking and insulting Jews visiting the unofficial memorial. 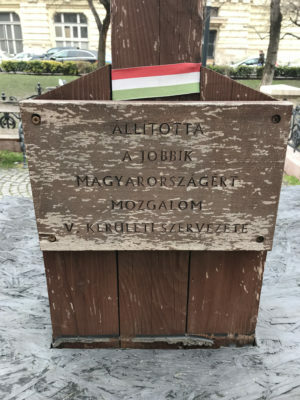 Jobbik, Hungary’s modern day nazi party, has also used the site of the Horthy monument to exonerate Horthy and mock the victims of the Holocaust. Just a few metres away from the Horthy statue they have erected their own unofficial wooden monument to Horthy. 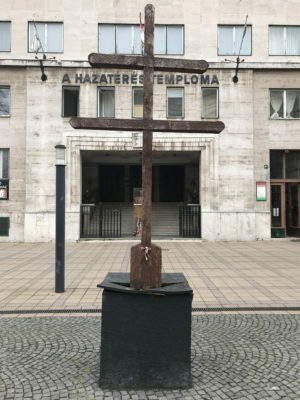 The authorities have refused to take it down and it stands in the middle of the pavement – a reminder that fascism, antisemitism and racism are deeply entrenched in Hungarian society.